As China’s national and international economic interests have steadily grown, so has the People’s Liberation Army’s ability to protect them. China’s expanding, social-media-savvy middle class now expects the military to protect the country’s citizens overseas. That expectation has been reinforced formally by the strategic direction  for the PLA to ‘protect the security of strategic SLOCs [sea lines of communication] and overseas interests’. From a Chinese perspective, the increasing number of Chinese citizens living, working and travelling abroad has imposed an obligation on the state to protect them. The Chinese leadership used to assume that, in most cases, other foreign powers would evacuate Chinese citizens along with their own from situations of unrest abroad. But things have changed over the past decade, and Beijing has introduced new policies and capabilities that have in turn generated new expectations among the Chinese population. More recently, President Xi Jinping’s Belt and Road Initiative has generated a further imperative to provide security abroad. China’s approach to overseas citizen protection can be explained as the response of a rising power to the need to protect its people and interests overseas as its influence expands and its capability develops, acting as a responsible global power. Alternatively, the policy could be seen as a justification for the projection of power to underwrite China’s growing competitive stake in world affairs. It’s important to note that Beijing uses the term ‘overseas Chinese ’ to describe ‘Chinese citizens residing abroad and foreign citizens of Chinese descent’. That includes Han Chinese and any of the other ethnic groups from China, as well as people in other countries whose families haven’t been citizens of China for several generations. For example, 1.2 million Australian citizens identified themselves as having Chinese ancestry in the 2016 census , and only 41% of them were born in China. The use of ‘overseas Chinese’ as an official term, particularly in relation to China’s obligations to protect, clearly raises questions of sovereignty. China’s 1982 constitution expresses the state’s intention to protect its people and interests abroad. But the Chinese Communist Party didn’t have the capacity to enforce its policy of ‘overseas citizen protection’ (海外公民保护) until recently. The catalyst for change occurred in 2004 when 14 Chinese workers were killed in Afghanistan and Pakistan. The domestic uproar compelled  the CCP to acknowledge that large numbers of Chinese were living in high-risk environments overseas. As a study  by the Stockholm Peace Research Institute reveals, China conducted small-scale non-military operations to extract citizens in times of crisis or disaster from Solomon Islands, East Timor, Tonga and Lebanon in 2006, Chad and Thailand in 2008, and Haiti and Kyrgyzstan in 2010. Before that, the only evacuations of note had been from Indonesia in the mid-1960s and Kuwait in 1990. In 2011 came the largest Chinese evacuations to date. During the Arab Spring uprisings, China repatriated 1,800 citizens from Egypt, 2,000 from Syria and 35,860 from Libya, along with 9,000 from Japan after the Tohoku earthquake. The evacuation from Libya  was the first to significantly involve the PLA, mainly in a coordination role. The operation took 12 days and involved 74 civilian aircraft, 14 ships, and around 100 buses . After that experience, China’s military purchased more airlift and amphibious capability for situations in which civilian charters wouldn’t be available, such as in remote locations or high-threat environments. While that equipment can be required for evacuation operations, it is also fundamental to force projection. The evacuation from Yemen in 2015 , carried out exclusively by the military, was the first time the Chinese navy evacuated citizens of other countries as well. 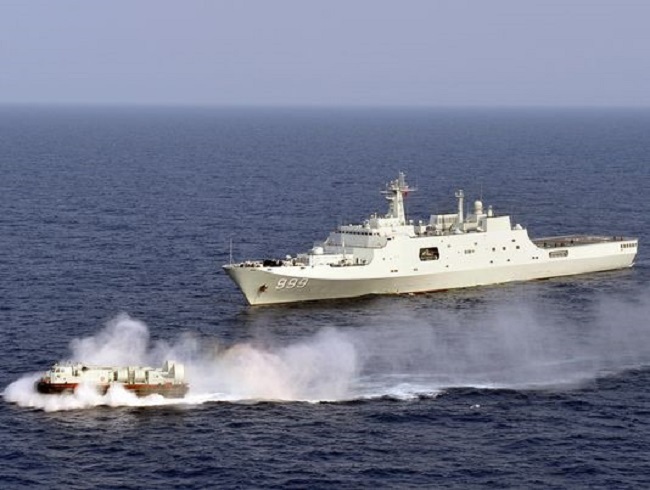 Between 30 March and 2 April, the naval command diverted a flotilla of three PLA Navy vessels from a counter-piracy mission in the Gulf of Aden to the port of Aden. They evacuated  629 Chinese nationals and 279 citizens from 15 other countries (including Germany, India and the UK) to Djibouti. Chinese observers viewed the operation  as a successful demonstration of the navy’s new rapid-reaction capabilities, developed through missions in the Gulf of Aden and off the Somali coast. Beijing continues to face a rising expectation to protect its people overseas, as shown by the public reaction to the killing of Chinese citizens by militants in Syria, Mali  and Pakistan . Other evacuations have included  the extraction of Chinese workers from Samarra in Iraq in 2014, Chinese embassy and medical staff from Sudan (after two Chinese peacekeepers were killed) in 2016, and Chinese citizens from Dominica, Antigua and Barbuda in the Caribbean after a hurricane. Last year, China evacuated more than 2,700 tourists from Bali after a volcanic eruption. The Central Military Commission decided in 2018 to expand  the PLA Marine Corps from 20,000 to 100,000, with some units to be stationed overseas. One source claims  10,000 of these marines will be based at China’s first declared overseas military base, in the port of Obock in Djibouti, and more are likely  to be based at Gwadar in Pakistan. They will protect Chinese oil imports from the Middle East at strategic nodes along the ‘belt and road’. The new marines and bases are part of China’s strategy of ‘far seas protection ’ (远海护卫), which requires the navy to safeguard overseas interests, including resources, strategic sea lanes, overseas citizens, investments and commercial entities. It has led to the development of a blue-water navy capable of operating globally  with aircraft carriers and amphibious capabilities. As the PLA’s capability to project force and protect Chinese citizens overseas continues to grow, so does the CCP’s readiness to implement the policy of overseas citizen protection, and the Chinese people’s expectation that it will do so. As China’s global influence expands, unexpected friction could arise when the policy of overseas citizen protection is applied to situations outside China’s traditional core interests. Such actions are at odds with Beijing’s frequently enunciated foreign policy principle of ‘non-interference’. One hypothetical example would be a recurrence of the anti-Chinese riots experienced in Tonga and Solomon Islands in 2006 and Papua New Guinea in 2009. Significant numbers of Chinese citizens could be at risk in Melanesia, where traditional partners (such as Australia, New Zealand and the United States) expect to provide the forces for evacuation and, if necessary, stabilisation operations. Without adequate preparation, clear communication and shared understanding, an evacuation operation by the PLA in the South Pacific could lead to unintended consequences, raising questions of sovereignty, citizenship and jurisdiction. Such a development could be disadvantageous to the host nation, its traditional partners and China. This concept has been described  elsewhere  as ‘accidental friction’. In part 2, I will explore recent trends in Chinese filmmaking that aim to generate patriotic pride in domestic audiences, while also attempting to normalise the perception of Chinese power projection within the international community. Peter Connolly is the director of the Australian Army Research Centre. He is researching Chinese interests in the Pacific for a PhD at the Australian National University. The views expressed in this article are the personal views of the author and do not represent the position of the Australian Army or the Department of Defence (further information). Image courtesy of Times Asi on Flickr.